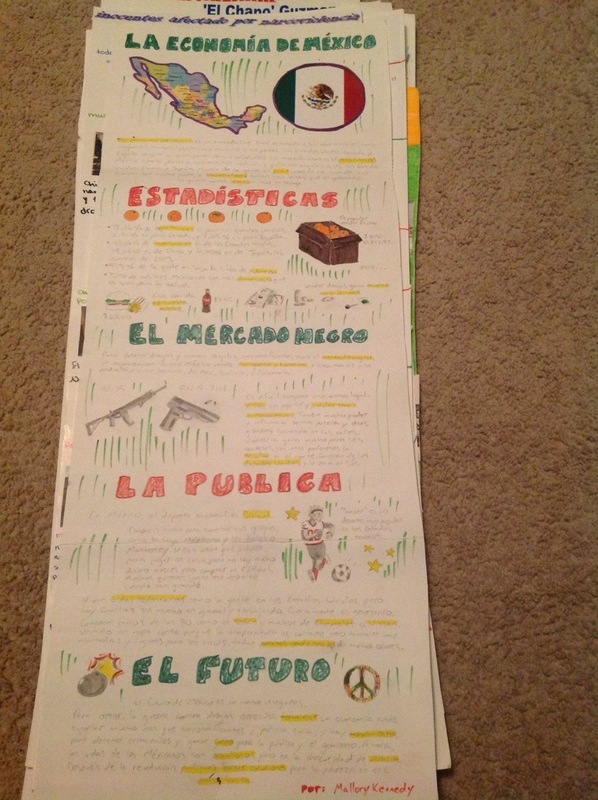 Spanish 4 Narcoviolencia final Projects: infographics! We have limited access to technology at my school so we often have to low tech our high tech projects. This was no exception. 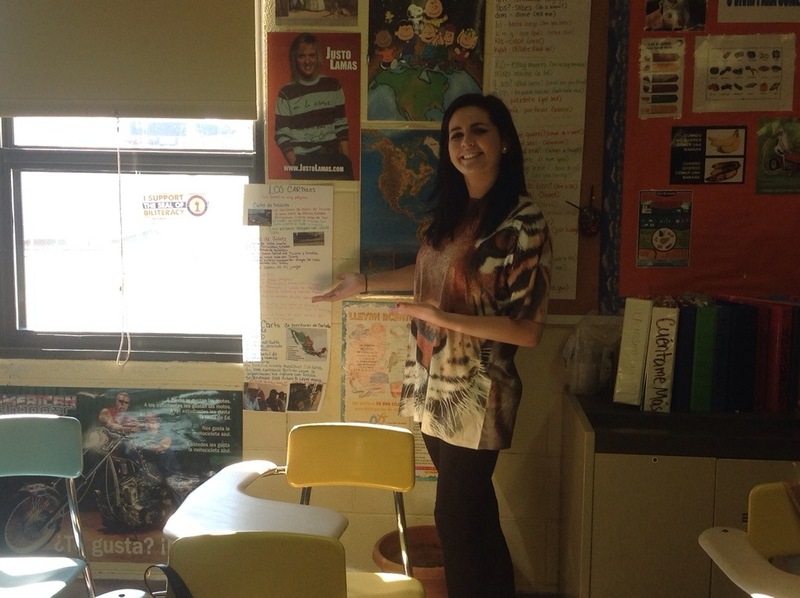 I wanted students to develop writing skills but also wanted to branch out from the traditional essay! 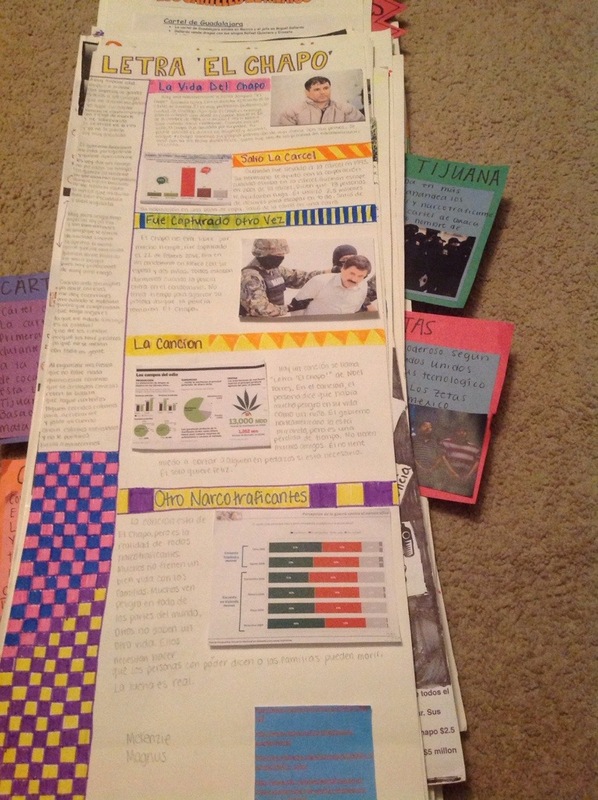 The infographics had to contain 5 headings, 1 chart or graph, 1statistic, and 5 paragraphs of 6 sentences minimum. The paragraphs could be spread out on the infographics to describe the required 5+ pictures. These are some of the finished products. So much more fun to grade (and create) than essays! We presented them today art gallery style. It is a class favorite to present that way. Half of the students displayed their work and the other half were gallery patrons. I served a meat and cheese tray and sparkling grape juice as they toured the infographics. They received two speaking grades. One presentational and one interpersonal. Each patron had to visit three displays, the artist gave 5+ interesting facts about their research (presentational speaking grade) and the visitor had to ask two follow up questions of each artist (interpersonal grade for both the questions and answers). It seems hard to listen to everyone at once but it isn’t bad. My classes are both 20 so I was only listening to 10 pairs at a time. Since they had to visit 3 posters, I was able to listen to everyone as I served the snacks! Thanks for sharing this terrific project. 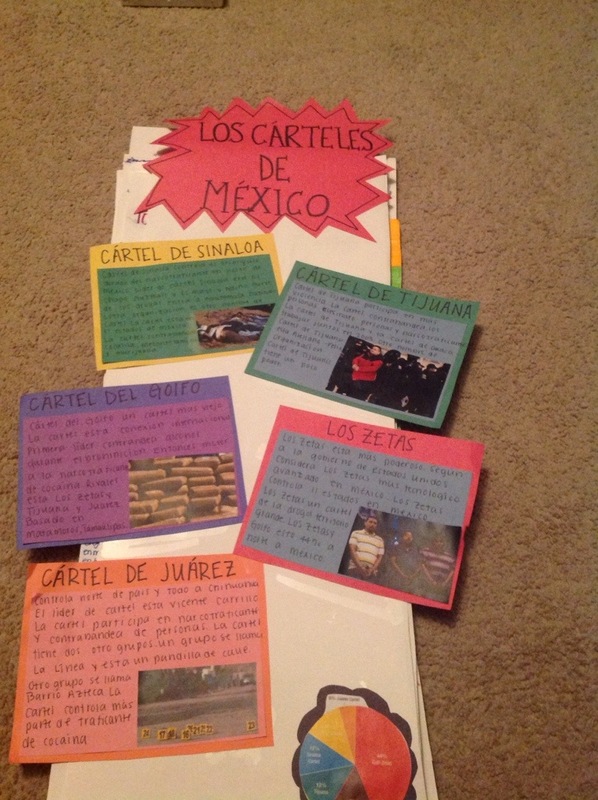 We’re working on a “world problems/solutions” unit and, of course, narcotraficantes are a bit topic. Your project makes me feel we could improve by expanding into different directions. I really want to do this as well but I only have up to Spanish 2, and that class is very small. Suggestions on doing this for Spanish 1? Also, do you happen to have a grading guide that you used? Thanks for any help you can give! Would you mind sending me a copy of your grading rubric and also the instructions you gave your students? I would like to have my Spanish III class create an infographic for the novel we are finishing and am working on creating a rubric and instruction sheet and would like to see how you set it all up. Muchas gracias! I’ll post the guidelines and rubric here! Hi! I just “found” your blog and am interested in the guidelines you required for this project – have you posted them and I just can’t find them? Thank you! You may use what you learned throughout the unit or any reliable Internet source to conduct your research. Look deeply for how this war affects the people and the politics of Mexico. You will be creating your own infographic using the information that you find during your research. You will create the infographic using a half sheet of posterboard. Pairs of students can purchase one posterboard and cut it in half LONGWAYS. Please bring the posterboard as soon as possible. We will be in the lab March 4-7 where you will be able to print anything you need for the project. •	Should be evident that you did not use a translator… just don’t do it!! For your assessment you will have a history fair. You will all be expected to display your infographic, ask questions of each other, and describe your work to each other. This day will be conducted entirely in Spanish. Each occurrence of English will result in a grade reduction. You will be evaluated on your ability to converse about your art and the art of yoru classmates on that day.